My younger colleagues were surprised by the liquor ads—“Evenings that memories are made of so often include DRAMBUIE,” read one. And we all chuckled over the fashion on display in the photos accompanying an article called “The Play’s the Thing,” which was excerpted from 1976’s The New Games Book. But I marveled at the quality of the games and puzzles included in the premier issue. They’re clever, engaging, and have stood the test of time. 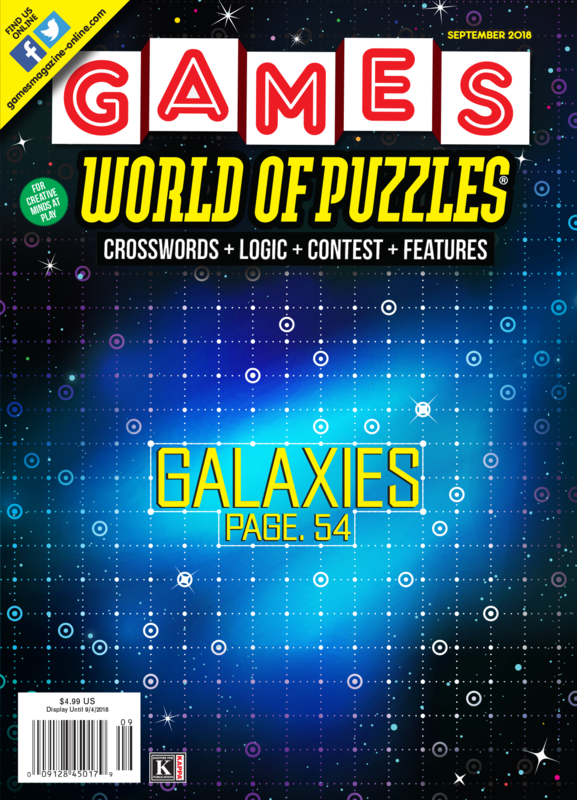 In fact, some of those puzzles, like “Lots of Luck” (a precursor to the World’s Most Ornery Crossword) are still featured in GAMES WORLD OF PUZZLES today. That retrospective glance was enjoyable for everyone involved, which is why I was delighted when Andrew Parr recently proposed a series of articles called “Moving Forward, Looking Back” where he will revisit earlier articles, contests, and puzzles to see how they stand up under the scrutiny of a contemporary game geek. Parr, you may recall, is an occasional contributor whose most recent piece was “Escape the Panic Room” (June 2018). For the inaugural article in this series he returns to GAMES’s very first contest, “Millionaire” (page 40). That contest was a combination letter/arithmetic puzzle, and if you really want to get in the mood, we recommend dusting off your old Texas Instruments SR-10 calculator! Of course, there’s plenty of other great stuff in this issue. Scrabble correspondent Scott Appel positively beams with pride as he relates how his middle-school Scrabble team fared at the recent National School Scrabble Championship, which was held at Lincoln Financial Field, the home of Super Bowl champions, the Philadelphia Eagles (page 42). Auto enthusiasts will want to race ahead to Jonathan Schmalzbach’s column “This Old Game” (page 41). This month, he compares two racing card games, one with a Gallic twist. There’s also a brief history of the beloved board game Clue by Julie Harris (page 34). Finally, for those of you in back-to-school mode, Raymond Simon has come up with a pop quiz to test your knowledge of college movies (page 38). Oh, and I almost forgot: There are plenty of puzzles, too. So sharpen your pencils and start solving!